Driving from the gate to the reception of Heia Safari Ranch you can experience nature already by spotting zebras roaming around the Ranch area. The hotel is a thatched stone building offering accommodation and day and overnight conference facilities for up to 80 delegates. The air-conditioned conference centre together with 4 syndicate rooms lies adjacent to the main building. The restaurant is an excellent venue for rural African weddings or private functions, and only 30 mins away from JHB and Pretoria. Whilst having a sundowner in our unusual African styled bar or sitting next to the pool enjoy the tranquillity of the Ranch. For a good nights sleep experience the comfort of one of our 45 African deco bungalows thatched all with en-suite bathroom. The Heia Safari Ranch is one of the most popular attractions in Gauteng - only a 30 minute drive from Johannesburg and Pretoria. In the tranquil African bushveld we offer unique African ambience with the experience of mystical Africa. Zebra and Giraffe roam freely around the hotel grounds. For a good nights sleep enjoy the comfort in one of our 45 two bed-roomed thatched bungalows; all with en-suite bathroom and a lovely verandah. The bungalows are fitted with Satellite .T.V. M-NET, radio, telephone and a coffee/tea machine. 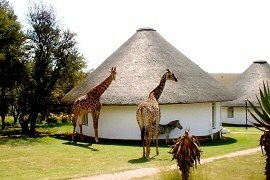 Enjoy a sundowner whilst watching Zebras and our family of Giraffes which roam around the hotel area. The 650 ha Game Reserve is nestled at the foot of the Swartkop Mountains, where game found their home in African bushveld. On our 1.5 hours guided game drive find peace and tranquillity by watching 22 varieties of game e.g. rhino, buffalo, hippo, wildebeest, impala, kudu, giraffe. For bird lovers ,176 species have been recorded. Indigenous trees are labeled. At your choice and for your account we can provide you with a cooler box, you only have to sit back and relax from the day to day routine and gain renewed inspiration.